Welcome to the wonderful world of SkyMaze. Enjoy the REAL 3D scene and professionally animated characters in this Pacman-like arcade game. Lead your Sky hero through the maze and collect crystals, but caution: bad opponents try to stop you. 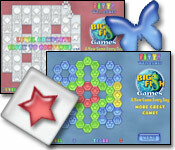 The full version offers 3 game types: "Baby Trip", "Journey", "Big Adventure". Play over 75 imaginative levels with power shields, freeze bonuses, magic bridges and other features. You will enjoy 3D graphic effects and wonderful music score. Select your hero for a great journey: SkyBoy or SkyGirl. Play through level after level, battle wily monsters (bloodless-for the kids) and win! Unleash the power of your video accelerator and bring the stunning graphics to your computer. 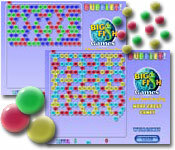 This game is the best in strategy with hand eye coordination and vivid graphics. Good, clean fun for all the family. it, you kill every monsters you come into contact with. You can find a magic signs in SkyMaze. Just go over them and you will switch on a magic bridge! It will help you to get to the closed parts of SkyMaze. Also each level has a time limit. These items appear on the playing field occasionally, and are well worth picking up! Score bonus These just increase your score. Life bonus A free life! Time bonus Gives you an additional 30 seconds. Freeze Puts the monsters to sleep in 5 seconds. Shield Gives you an ability to kill monsters in 5 seconds. NOTES: Each monster has its own technique for chasing you. Learning these can help you avoid them. Some bonuses fall down on the same places to help you. Type one of these words in the game to cheat codes activation! "Resolution" - Set display resolution in the game. Select lower value to increase the performance or higher value to increase picture quality. "Music" - Controls ON/OFF music. "Sound" - Controls ON/OFF sound effects. "Player" - Select a character: Boy or Girl. "Joystick" - Set to ON if you want to use joystick. "Return" - Return to main menu. SkyMaze is distributed on a shareware basis. You can register your copy of SkyMaze at a cost of $19.95 (US). Your registration will be valid for all future versions of SkyMaze. The registration fee will license SkyMaze for use on one computer in your home, and on one computer at your workplace. 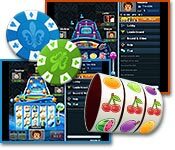 If you wish to use SkyMaze on several computers, you should purchase several single licenses. You can purchase SkyMaze via the World Wide Web. This is the fastest and the easiest way. All registrations use SECURE protocols. It is impossible for a third party to intercept your credit card information. Important: when you are filling in the order form, please check twice that your e-mail address is correct! If your e-mail address is entered incorrectly, we will be unable to send you the registration key. We do not give your personal information or email address to anyone; it is for our own use only.